A conservative teen pulled a full Reagan during teen-day at the Polish Parliament. The young teen castigated the EU and ripped up a may of the European Union during his short speech. At Poland’s regular Teen Day in Parliament, a number of speakers came to discuss matters of importance to the MPs but it didn’t go as the left had hoped. 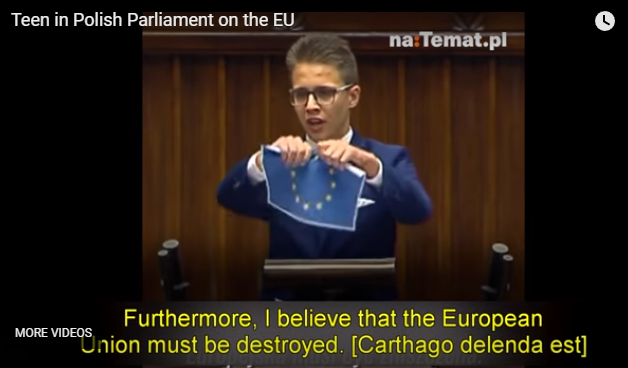 This young teen pulled the full Raegan on them including the speech ender, Cartago delende est, where Carthage is now Brussels. The liberal tyrants are going to have to do a better job indoctrinating the youth in Poland.